Our pal, Shane Dixon Kavanaugh from OVERFLOW Magazine recently sent this out. Very worth attending. Resolve yourself to drink this Thursday, in the company of staggering minds and familiar strangers. 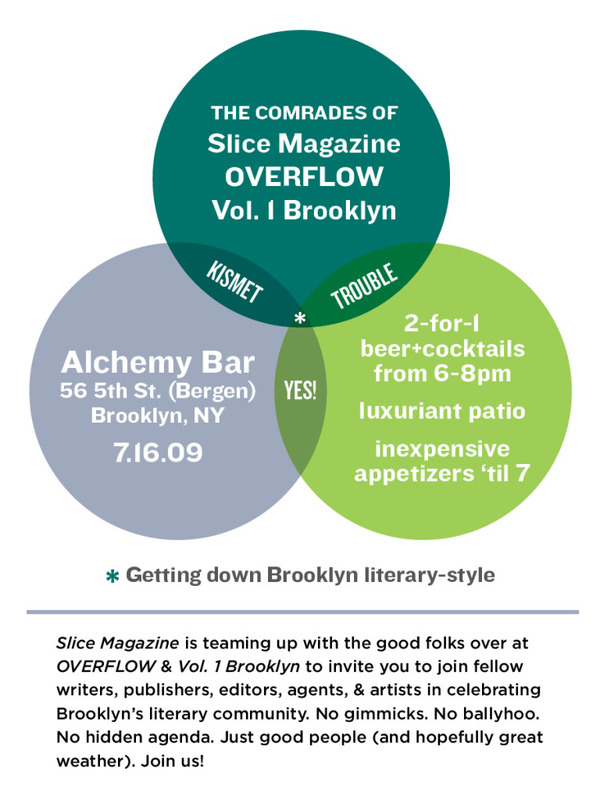 A few of the good folks over at Slice Magazine, OVERFLOW, and Vol. 1 Brooklyn cordially invite you to join fellow writers, publishers, editors, agents, and artists in celebrating Brooklyn’s literary community. No gimmicks. No ballyhoo. No hidden agenda. Just good people (and hopefully great weather). Alchemy, over on 5th Avenue and Bergen Street in Park Slope, has been kind enough to offer all of us their back patio from 6-8pm on Thursday, July 16th. In addition they’re willing to serve us 2-for-1 beers/ cocktails and a variety of exquisite and inexpensive appetizers until 7pm (the dozen muscles in a tomato-cilantro sauce for $5 come highly recommended). If you can beat that with a stick, then, by all means, go right ahead. Please feel free to cast this invitation far and wide. While we encourage you to bring a friend or two, we hope you make some new ones as well.